All group visits need to be booked in advance via our online booking system. We are a realtively small museum and booking is essential to avoid the possibility of being turned away, it also helps us to keep our visitor records up to date. The maximum number per group is 35 plus adults and we can only accomodate one group at a time. Please make sure that you bring enough adults with you to conformto LEA guidelines in terms of pupil/adult ratio for trips. Larger groups can be accomodated over two or more sessions. Many large groups choose to combine a visit to the Sedgwick Museum with visits to other nearby University Museums. Opening hours and group visiting policies vary so please contact individual museums for specific details. There is no admission fee for groups, including facilitated workshops and welcome talks. 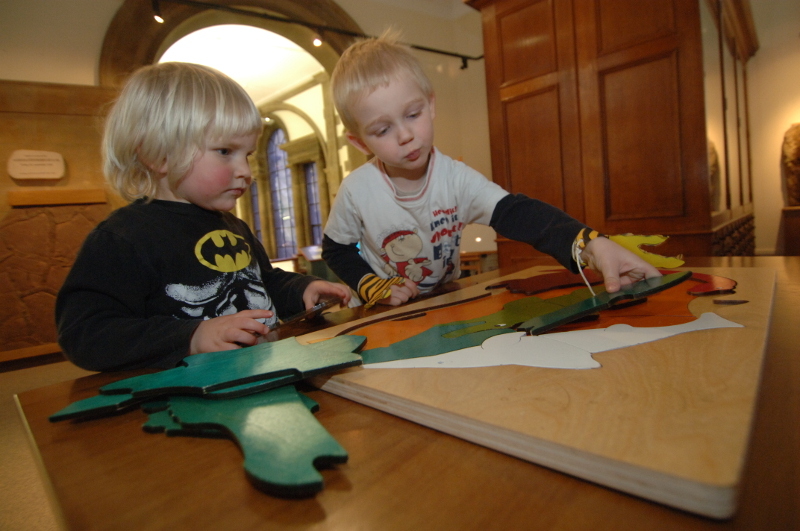 We invite donations of £2 per child from school parties visiting the Museum and using the education service. Unfortunately we do not have a cafe or eating area at the Museum, and food must not be eaten in the gallery. There are a number of open spaces nearby for picnics in good weather. Some schools have used Emmanuel United Reformed Church for their lunch break which is 5 minutes’ walk away. It can be rented by the hour for a small fee. There is a rack for hanging up bags and coats in the Museum porch, though the Museum cannot accept any responsibility for loss of, or damage to, items left here. The Museum is a public space as well as a place of work for University staff, and is used by many different groups and individuals for learning. Please help us to make everybody’s visit to the Museum safe and pleasant, and respect the needs of people working nearby. It is the responsibility of the group leader to make sure that members of the group are aware of these points, and to also inform helpers that it is their shared responsibility to maintain these standards during the visit. If you are unable to book a facilitated visit there are classroom resources and loan boxes as well as activity boxes and resources to use in the museum. The Education Team are always happy to arrange a pre-visit meeting to help you plan your visit. We have a small shop with real fossils and minerals as well as toys and pocket money items.